What is the world coming to…Oleander cookies? 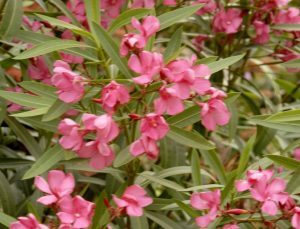 Oleander can kill a dog causing GI signs and arrhythmias…if you suspect your dog ate Oleander, have him/her evaluated by a veterinarian immediately! A Sonoma County woman’s horse and dog were killed, and another horse she owns was sickened, after the animals ingested cookies laced with poison that apparently were deliberately left for them to eat earlier this month, officials said Tuesday. Deputies recently identified a person of interest in the poisoning case, but authorities would not give details about the possible suspect, said Sgt. Cecile Focha, a spokeswoman for the Sonoma County Sheriff’s Office. The animals became ill on Feb. 12 after someone planted the homemade cookies laced with oleander toxicity on the woman’s property in an unincorporated area of Sebastopol along Kennedy Road.